The number 1 frustration I hear from parents at this time of year, is that they feel their children are not showing gratitude. They throw out terms like spoilt, bored, selfish and ungrateful when talking about asking for and receiving gifts. Let’s look at this realistically. In December, children are constantly being bombarded with images from media telling them what they should ask for. Parents, relatives and friends are asking what they want for holiday gifts. They are even writing letters to Santa in school as a part of their English lessons. People focus so much on the perfect holiday experience. Often this means spending money and giving gifts. We are asking our children to regularly focus on what they want and then becoming frustrated when they are regularly focusing on what they want. When you take a step back and really thing about it, our expectations of output do not match our expectations of input. I am not condoning or criticising how anyone chooses to spend the holidays. Instead, let’s look at adding to your festive season. Here are 5 ways to help your child demonstrate gratitude and learn this skill. There are many people in our everyday lives whose job it is to make our lives better. These include: public servants, receptionists, shop keepers etc. Their lives become much busier over the month of December. What would it be like to give them a thank you for their efforts? Take mince pies into the post office to say thanks for working late. Write a thank you card to the town council for the lovely lights they put up. Doing this with our children opens up their awareness of how society works together for the betterment of each other. It also allows them to build the skill and value of appreciation of hard work and effort. From large family meals to quick supper before football practice, eating is a part of our daily experience. How hard is it when you put in effort for a meal only to be greeted with complaints. Instead, make them a part of it. Let them see how much time it takes to cut the carrots, bake the bread or mix ingredients. There are several benefits to this. Practically, they are learning life skills. They also have more buy in to eat food that they have helped to prepare (less complaining). On a deeper level, they are learning that food does not materialise from nowhere. They see the process, which helps them to appreciate the time investment it takes on someone else’s part to make sure they are fed. If we talk about the process whilst doing it, we can show them why their gratitude is warranted. There are few things more horrifying as a parent than when a child opens a gift and expresses their dislike of it in front of the giver. However, how can we expect them to react differently when they have not been taught. Take a few minutes and talk about the socially appropriate ways we have for receiving gifts that do not fit our tastes. Practice it through role play. That way, our children are prepared to meet the challenge should it arise. 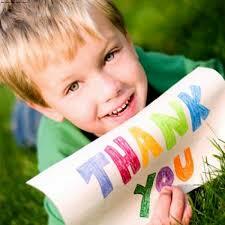 Children express gratitude in many ways. It could be through facial expressions, hugs or words. When your child shows appreciation, notice it and name it. Help them build their vocabulary of gratitude by using descriptive praise. Saying something like, “I noticed the way you hugged your dad when he brought home pizza for supper. That shows me that you wanted to give him a big ‘Thank You’ for bringing this special treat.” This way, you are acknowledging their physical appreciation and adding to it with words. You are showing them that gratitude is a value they have. How Do You Teach Your Child Gratitude? In today’s materialistic world where kids have a disposable mentality – it is particularly important to encourage them to practice gratitude and appreciate what they have, especially in the run up to the festive season. The busyness and focus on buying gifts at this time of year, can leave children feeling a little overwhelmed, unfulfilled and entitled, losing sight of what is truly important. I am sure many parents have been in that embarrassing situation when your child absolutely refuses to say thank you to granny for her gift. Or the child who nags you for months for a particular toy and within a few hours of receiving it, never looks at it again. How do you encourage children to say thank you and actually mean it? Research clearly shows that gratitude plays an important role in a persons’ well-being and success. A study by Dr Robert A Emmons shows that cultivating gratitude can increase happiness levels by up to 25%. It boosts self-esteem, empathy and optimism and improves relationships. Slowly but surely this habit will start to feel automatic and genuine rather than forced. Find a time of day (e.g. dinner time or bed time) to share a few things that you are really grateful for or happy about. Every day I encourage my kids to share their ‘rose’ and ‘banana peel’. The rose being something they were happy about or proud of and the banana peel is if they have something amusing that happened. If daily is unrealistic, start with at least once a week and your kids will still benefit. This is a lovely way to record all the positive events that happen. Write on a piece of paper all the moments you are grateful for as they happen and pop the paper in a jar. Encourage all members of your family to do the same. Agree a time, maybe once a month that you empty out and read through the contents of the jar. This helps your children look for the positive things in life. It is particularly helpful on those days when they are ‘bored’ at home or complaining so they can remember all the good moments. Instead of the jar you could have a book where the family record all the things you are grateful for. Find ways for your children to volunteer in the local community, doing something thoughtful for someone else. Helping others and being generous are a very important part of feeling grateful. Encourage them to set aside a small amount of their pocket money or Christmas/birthday money to give to those less fortunate and help them decide what cause it should go to. Encourage them to work out what their strengths are and how they could help. This enables them to develop a passion and sense of purpose and connection with others. Ask them to write a list of gifts they’d like to give to people that they love. Sadly the whole tradition of hand written thank you notes seems to be dying. However encourage your children to write in birthday or Christmas cards to friends and family, what specifically they appreciate about that individual. Maybe there is someone else who made a difference in their life this past year ago that they never properly thanked like a teacher, football coach or aunty. This is about thanking someone not for something of material value that they gave you but for what they have done for you. If they are too young they can dictate it to you. It’s best if they can deliver it in person and see the person’s reaction when they read it. I still ask my children to handwrite write thank you notes and rather than just saying thank you extend it to say what they appreciate about the gift. It’s also a great way to practice writing skills for little ones and always more motivating when they are writing for a purpose. If your children are too young to write, they could say thank you on a video message or to take a photo of them using the gift. For children to fully appreciate all that parents do to ensure that the household runs smoothly, they need to be involved in helping. Of course you need to work out what is appropriate according to their age and stage of development. Encourage them to be as independent as possible and contribute to chores at home. If they can prepare a meal or put the washing on and then lay it all out to dry, they will understand the time and effort involved in doing these things and appreciate it more when it’s done for them. You are also teaching your children important life skills so that when they leave home, they are not totally incapable because everything has bene done for them! Children expect to be bought new trainers when theirs no longer fit or to be allowed to have play dates. These things should be earnt by doing their part; homework and contributing to household chores. Older children can earn pocket money or get a job to save up for something rather than just getting it. Also giving them your time and experiences builds relationships and is much more powerful than a gift. What children want most from parents is simply time and attention. Gratitude is all about stepping back and appreciating what you already have, rather than thinking about what you still want. The relationship between gratitude and happiness is very strong. It is truly a mindset and life style.